Peter Cummings is a patent attorney focusing on preparing and prosecuting U.S. and foreign patent applications in a diverse array of mechanical and electromechanical technologies, including vehicle structural components and impact energy management systems, automotive control systems, athletic equipment, medical devices, and consumer electronics. In addition to patent prosecution, he provides opinions for identifying potential infringers in competitive landscapes and advises on freedom to operate for new products. 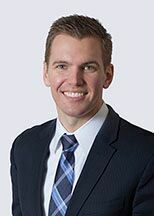 He is also experienced in advising clients on joint development agreements, licensing agreements, and other technology purchase and transfer agreements.